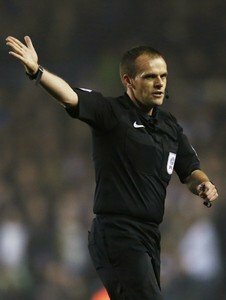 Who Is The Ref For Our South Yorkshire Derby? The man in charge of the Millers South Yorkshire derby at Bramall Lane on Saturday is Geoff Eltringham from County Durham. Sunderland supporter Geoff played football at school and, after leaving, decided he still wanted to be involved in the game and thought refereeing was the best way to do that. He came through the ranks, being promoted to the National List of Referees in 2009. The last time Geoff was in the middle for a Millers game was at the New York Stadium in August when a twentieth minute Shaun Raggett goal gave Rotherham a one-nil win over Millwall. Geoff was at the New York Stadium in February 2018 for the South Yorkshire derby when Doncaster Rovers were the visitors. John Marquis put the Rovers in front six minutes before half-time but as the board went up for twelve added minutes of injury time up popped Michael Smith to get an equaliser. Then in the last minute of time added on Smith was fouled in the area and Joe Newell put away the resulting spot-kick to give the hosts a two-one win. The 2016/17 season saw him in charge of the Millers twice, the first being their last home win in January against Norwich City. The Millers went in front on just seven minutes when a cross from Tom Adeyemi was tapped in by Jerry Yates for his first league goal for Rotherham. On eighteen minutes Norwich went down to ten men when Nelson Oliveira was sent off after hitting Kirk Broadfoot in the face. The Canaries pulled level six minutes into the second half with a Cameron Jerome header but Adeyemi gave the hosts all three points nodding the ball into the net four minutes later against his former club. Lewis Price, Richard Wood and Will Vaulks saw yellow on the day alongside City’s Will Hoolahan and Steven Naismith. He was at the New York Stadium in March 2017 when goals from Anthony Knockaert and Solly Match gave Brighton and Hove Albion a two-nil win. Will Vaulks was the only player to see yellow on the night. Geoff was in charge of our Boxing Day 2015 game when Bolton Wanderers were the visitors at the New York Stadium. Four second-half goals – Grant Ward, Danny Ward, Joe Newell and Jonson Clarke-Harris – gave the Millers all three points on the day. Earlier the same season Geoff was at the New York Stadium when Fulham were in town. Former Miller Ben Pringle gave the visitors a seven minute lead and a poor challenge on James Husband seven minutes later from then Millers skipper Greg Halford gave the referee no problem in pointing to the penalty spot which Ross McCormack put away. Jonson Clarke-Harris halved the deficit on seventy-two minutes and as the Millers were looking for an equaliser Cauley Woodrow went down the other end and made it three-one in the final minute of the game. Chris Maguire for the Millers and Fulham’s McCormack and Lasse Vigen Christensen saw yellow cards that day. Geoff was also in charge of a Millers match in February 2015 and didn’t make that much of an impression on Steve Evans. Rotherham took on Blackburn Rovers at Ewood Park. Craig Conway put the hosts in front four minutes before half-time but a goal on seventy-two minutes from Matt Derbyshire made it one-one. Unfortunately for Rotherham Jordan Rhodes scored a winner for Rovers in the final five minutes of the game. What infuriated the Millers Boss was Mr Eltringham’s failure to see a blatant handball in the area in the first half which Steve Evans later got an apology about. He was also unimpressed with the way that the ref wasn’t counting the correct number of yards for free-kicks – with Millers fans even helping him at one point! March 2014 also saw him at the New York Stadium when the Millers beat Brentford three-nil with two goals from Kieran Agard, one a penalty, and one from Haris Vuckic on the stroke of full-time to give the Millers all three points. Geoff was also in the middle for our game against Burton Albion at the Pirelli Stadium in February 2012. Calvin Zola put the home side in front five minutes before half-time with Shaun Harrard equalising for the visitors ten minutes into the second half. That day Geoff booked Jack Dyer from Albion and the Millers’ Danny Harrison and Alex Revell. His first game in charge of the Millers was at the Crown Ground when the Millers visited Accrington Stanley in October 2010. Stanley went in front on nine minutes when Millers ‘keeper came way out of his area to try and get to the ball but Andy Parkinson got there first and slotted the goal into the back of the net. On the seventeenth minute debutant Kevin Long saw red after pulling back Millers striker Adam Le Fondre in the area and being the last man he had to go. Le Fondre scored the resulting spot-kick and the teams went in level at half-time. Four minutes into the second half the hosts regained their lead after a corner kick found Jimmy Ryan and he smashed the ball into the back of the net. With ten minutes remaining on the clock a Nicky law corner found the head of tall defender Exodus Geohaghon who put the Millers level for the second time. With it looking like the teams would share the points a long throw from Geohaghon found Ryan Cresswell and the Miller skipper headed the ball into the net to give the Millers all three points. That same season he was also in charge of our goalless draw against Barnet at the Don Valley Stadium which included a red card for Tom Newey on seventy-one minutes. In the thirty games Geoff has been in the middle for this season he has shown one hundred and eight yellow cards and four reds. Running the line at Bramall Lane we have James Mainwaring and Nick Greenhalgh with the Fourth Official being Graham Salisbury from Lancashire.